Over the past ten years at Convince & Convert, we’ve continued to refine our social media strategy. Here’s one of our latest iterations that we use as a jumping-off point for our social media consulting clients. In 2019, everyone is “doing” social media. It’s an established part of most marketing plans. But not many companies are BEING social as well. With all the new tools and platforms constantly emerging, it’s very easy to fall into the trap of thinking about social media through a tactical prism instead of a strategic one. The best social media strategic plans are tool-agnostic and set forth objectives and metrics that supersede any particular social venue. 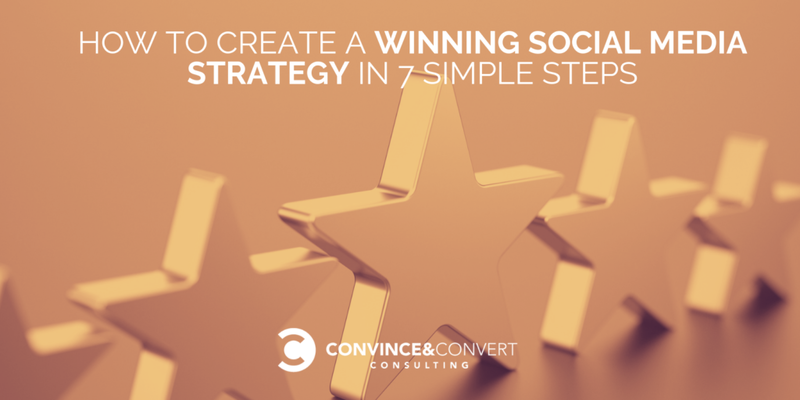 Let’s take a look at the best way to create a winning social strategy. Nobody should “own” social media strategy in your organization. Social impacts all corners of the company and should be more like air (everywhere) than like water (you have to go get it). Thus, the first step in the process is to create a cross-functional team to help conceive and operate the rest of the strategy. Decide who will be involved, including sales, customer service, marketing, content, etc. Yes, you can use social media to help accomplish several business objectives. But the best social media strategies are those that focus (at least initially) on a narrower rationale for social. For what do you primarily want to use social? Awareness? Sales? Loyalty and retention? Pick one. It’s an old social media strategy chestnut by now, but “listen” is still good advice that’s often ignored. The reality is that your customers (and competitors) will give you a good guide to where and how you should be active in social media, if you broaden your social listening beyond your brand name. Analyzing how and where your audience is naturally holding digital conversations can save a world of trouble. Rather than starting from scratch, find channels in which you can interact with audiences who are already talking about (or attempting to talk to) your brand. Now that you’ve listened to your audience, decide with whom you will be interacting in social media. What are the demographic and psychographic characteristics of your current or prospective customers? How does that impact what you can and should attempt in social media? Configuring audience personas, including their online behavior, values and challenges, will help you determine not only how to talk to your audiences but also where to carry on these conversations. Audiences of certain demographics and behaviors are more easily activated on some channels than others. How are you going to determine whether this is actually making a difference in your business? What key measures will you use to evaluate social media strategy effectiveness? How will you transcend (hopefully) likes and engagement? Selecting KPIs (key performance metrics) sets organizational expectations about how the ROI of your social media efforts will be measured. A social media strategy is an exercise plan, not a quick fix. Success will be seen, but only through patience and perseverance. Thoughtful KPIs and realistic quantifiable quarterly goals are necessary in maintaining leadership buy in for the long haul. Your organization’s success metrics are reflective of your expertise. For example, advanced organizations track customers through the funnel — from social media engagement to sale. Beginner organizations focus on reach, impressions and various engagements. The three social media metrics outlined in this ebook will help you begin optimizing the way your organization measures and analyzes your customers’ digital actions. Good is no longer good enough: your brand, and your content, must be outstanding. What differentiates you from your competition? In a world of clutter, your brand must have an outstanding characteristic that captivates and engages your audience. It doesn’t matter who you are or what you sell. Your product features and benefits aren’t enough to create a passion-worthy stir. How will your organization appeal to the heart of your audience, rather than the head? Disney isn’t about movies; it’s about magic. Apple isn’t about technology; it’s about innovation. What are you about? Only after you know why you’re active in social at all, and how you’ll measure social media strategy success, should you turn your attention to the “how” of Facebook, Twitter, Instagram and the rest. Your channel plan should help you understand with which audience you want to engage, your content plan and editorial calendar, any necessary resources and how you’ll measure the success of each specific platform. This channel plan should be distinct, in that you have a specific, defensible reason for participating in each. My last piece of advice: you must decide how you will be human. The mechanics of social force companies to compete for attention with your customers’ friends and family members. Thus, your company has to (at least to some degree) act like a person, not an entity. How will you do that? When we’re working on social media strategy for major companies, the plan and the deliverable is quite a bit more comprehensive than what you see above, but it’s based on this scaffolding and thought process. I hope you’ll find it useful in your own endeavors.